The horror stories keep coming but even so it is doubtful whether we have yet grasped the scale and seriousness of what is happening in the global economy. And, as we stand transfixed by the need to surmount the current crisis, few will lift their eyes to the longer-term implications of what is sure to be a seismic change in the way the global economy operates. We do not yet recognise that the imperatives that have driven governments around the world to take steps that would have been unthinkable just a couple of months ago will not lose their force just because the immediate crisis is past. The measures that are now being put in place are essential in the short term, but they also point the way to a post-meltdown future where the world will (hopefully) never be the same again. • Governments must be kept well away from the main levers of economic policy? No. As even George Bush agrees, government action is essential. • Monetary policy is all that matters? No. Fiscal policy now takes its proper place in the armoury. • Only bankers are to be entrusted with the important decisions in our economy? No. As is apparent to everyone, banks worldwide have been irresponsible, foolish and greedy and their deficiencies mean that they must in many cases be taken into public ownership. • “Free” markets must be left unregulated and will always produce the best results? No. The market has failed and created a catastrophe. • All that matters is the bottom line? No. The goals of economic activity are wider than profit for a few. The truth is, in other words, that if we are to survive the crisis in reasonable shape and look to a better future, we must now abandon the nostrums that have ruled our affairs and have proved so destructive. We need governments to acknowledge their responsibilities, to take a major role in first rescuing and then regulating our economy, to use a much wider range of policy instruments, and to treat markets as hugely valuable servants but dangerous masters. John Maynard Keynes, take a bow! We may well be living through one of those seminal moments when the tectonic plates that go to make up the most important debate in modern politics have begun to move. 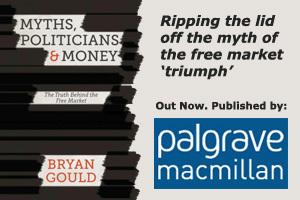 For as long as we have had what might be recognised as an economy – in other words, for 200 years – the pendulum of intellectual fashion has swung between two contrasting views of the proper role of government in managing the economy. On the one hand has been the view that governments have very limited capacity to manage the economy. Any pretension to extend that power will not only be self-defeating but also – because of the distorting effect on the proper and unfettered operation of the free market – positively damaging. Governments, according to this view, should limit themselves to those aims – such as the defence of the realm and maintaining the value of the currency – that are their proper concern. The other view is that government is a major player in the economy, both as an actor in its own right and as a coordinator of other actors and a maker of policy. It should accept, and perhaps seek and welcome, a responsibility for the performance of the economy – a performance to be measured not just according to monetary criteria but according to real phenomena such as output, employment and investment. The economy will perform better if the power of government is harnessed to the needs and interests of industry, and if government undertakes those functions – such as the provision of major infrastructure – that cannot easily be carried out by private industry. This latter view has a significant political dimension as well. If government is to do its job properly, it must use the power of democratic legitimacy to regulate and restrain the market so that society as a whole is protected against the depredations of powerful market operators. This view is on the whole (and not surprisingly) rejected by the right. But it is one of the most surprising and shameful aspects of modern political history that it has also been rejected – and enthusiastically so – by today’s “left”. New Labour has a question or two to answer. The lesson of this crisis is that unregulated markets certainly lead to economic disaster; but, even more importantly, they are incompatible with democracy. If markets are always right and must not be challenged, the result is not only economic meltdown but government by a handful of greedy oligarchs rather than by elected representatives. If democratic governments do not, will not or cannot exercise that power to protect their electorates, the course is then set inevitably not only for the crisis we now face but also for the abuses and failures that disfigured our economies in the years preceding the crisis. Shouldn’t our politicians be called to account?